Let’s face it, jargon is something that people use when they are trying to make something seem more complicated – and boy are we good at it in marketing! This “special language for dicks” as Adam called it is rife in the advertising world. Yet it’s a world that can be a lot of fun – not just for the people within it – but also the people consuming it – the line between advertising and entertainment should be a dotted one afterall. However, the jargon we use doesn’t exactly make it an accessible world. 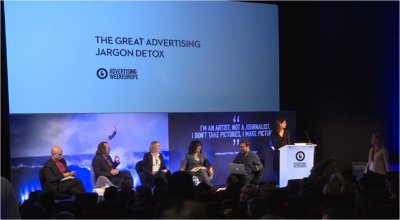 It was interesting to hear what these same people would do to improve the advertising industry. A lot were in agreement that they find advertising quite intrusive and one woman felt very strongly about the term ‘internet of things’ as well as pop up ads that distract you from the page content. So from all that what did the panel have to say? Sue kicked it off with her rant on engagement saying that she cannot bear it at all and that it basically just means that we hope the people we are trying to talk to don’t ignore us. Karen was next and her pet jargon hate was people saying ‘we need to make this go viral’ – it will either go viral or not, you can’t force something to go viral. David had recently heard a great one: ‘Data is the new soil it will allow our ideas to grow’. With a sarcastic snort he suggested that this just goes against everything that nature stands for. Omaid finished off by expressing his pure hatred for the phrase value proposition and because it is ill defined and used far too often. If we’re all so passionately against certain buzz-words it begs the question why there seems to a bucket load of new ones every year. Is it fueled by the fast-paced innovative nature of our industry, or is it creative people making new money out of old rope. What’s your view, and – while we’re at it – what’s your pet-jargon-peeve?